It turns out that quite a few blog and Facebook commenters are curious about my personal life. I guess there’s a need to understand what kind of person would befriend a man like Daniel Wozniak, and then actually write about him. Of course, lots of people have written about him, and put his story on TV. And I know mine won’t be the only book on the subject, either. But I will be the only writer who is actually friends with the murderer. Some people don’t appreciate me “giving him a platform” to tell his story to the world. Well, if you’ve read the entirety of this blog, you know all the major news networks were willing to give Daniel air time if he’d agree to be interviewed. Producers kept saying they wanted to let him tell “his side” of the story. I did post his letter to the readers because commenters were asking specific questions about Daniel’s day to day life in San Quentin. But none of that was related to his crimes. My book will include Daniel’s story of the murders. I’m writing about the influences that helped push him to make the worst decision of his life, and crush so many other people’s lives. I can reassure you all though, there won’t be any claims of his innocence. Daniel Wozniak committed atrocious acts. His motives do not change what he did. But his side of the story answered a lot of questions for my inner Nancy Drew and Carl Jung. I won’t deny I’m a little unusual. I have blue hair and tattoos and I’m chums with a murderer on death row. If that were the description of a character in a play, it would be an actor’s dream to portray her. But does being atypical mean there is something wrong with me? I don’t think so, but many a commenter has suggested just that. I must be sad and lonely (except for all my cats?) and a bit of a nut job to befriend an evil murderer. That just seems like a way to marginalize me, and use that as an excuse to ignore what I’m writing. I show the human side of a person who many believe to be unworthy of breathing. A story of Daniel trying to rescue a bird may be upsetting to some people, but that is the same man who committed murder. These juxtapositions are what fascinate me the most. As far as me being a money hungry fame seeker who is out to make a name for herself by riding on the coattails of a killer, well, the majority of true crime authors have not become famous or rich from their writing, and I honestly don’t expect to, either. Do you know, if you search for “True Crime Books” on Amazon.com, you get over seventy-two thousand results? Of those, how many can you name (without looking)? The truth is I just want to write a book on a topic I find interestng. I’m glad so many of you find it interesting as well. I feel lucky to have thousands of people read my blog regularly, and of course I hope you’ll all read my book too. I am putting a lot of work, thought, emotions and miles into this creative project (I recently got an exercise bike desk). I also recently decided to ask some of my close friends and family members how they personally feel about my blog and my friendship with Daniel Wozniak. I interviewed some people, and others sent me their thoughts in writing. Let’s start with my husband, because you guys ask about him a lot. I’ll admit it, I’m annoyed when people wonder “if my husband knows about my blog.” Of course he does. But what is the implication there? My husband will find out about my secret writing project, and then he’ll put the kibosh on it? That is definitely not the guy I married. My husband is completely supportive of my writing. He has a very successful creative career, and he’s completely open minded when it comes to anyone else’s artistic pursuits. I talk to my husband about my blog all the time. 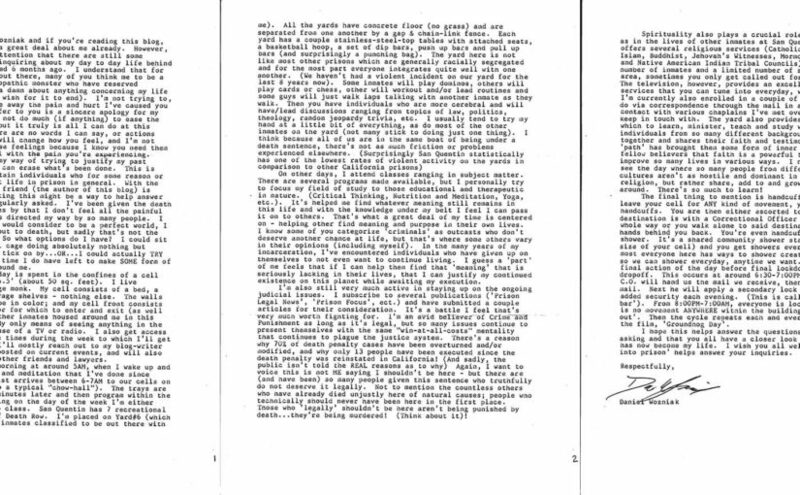 I share interesting, entertaining and sometimes disturbing prison tidbits that I learn from Daniel’s letters and phone calls. When I get a complimentary comment on the blog, I tell my husband about it. Sometimes I share the comments which aren’t so nice, and he reminds me to ignore the Internet trolls. He watches all those ID Network crime shows with me. He gives me Christmas presents like books about the last meal choices of Texas death row prisoners. And recently, my husband got me into a famous rock star’s house so I could see some original paintings by John Wayne Gacy (Pogo the Clown is so creepy). My daughter is an eighteen-year-old college student who is mostly absorbed with her own busy life. She gets great grades, she volunteers at a hospital, and she went to Coachella this year. She also loves to watch true crime shows. We recently devoured the three-part Casey Anthony special. Our current series favorites are Crime of the Century and See No Evil. As far as my friendship with Daniel, she sees it as part of my work. Sometimes she’s annoyed when Daniel’s phone calls interrupt something, for example tea time, a conversation, or watching a movie. When that happens, she calls him Danielle. “You’re going to tell Danielle you’re busy and can’t talk on the phone, right?” Of course, she already knows the answer. My family is always my priority. And my daughter does not care that Daniel only has limited access to a telephone. She likes to say, “Hey, if he wanted to talk on the phone all the time, he shouldn’t have murdered someone.” She’s a smart girl. My fourteen-year-old son is not interested in the true crime genre at all. I asked him if he has any feelings about my blog and my friendship with a murderer. He told me he never even thinks of it at all, but I shouldn’t take that personally. He doesn’t really care about his dad’s career either, except for the time he got to meet Cam Newton. My son’s life is about his friends, video games, guitar, eating and sleeping, family and school. Did I mention he’s fourteen? The plus for all my family members (and my dogs) is that I’m home a lot more now that I’m writing. When I was directing plays for the Hunger Artists, I would be at rehearsals every night for months. Weekends were also spent at the theatre. But now, I can make my own schedule that doesn’t need to include working around the availabilities of actors and designers. Every story needs to be told and every person has a story and they need someone to trust and to respect enough to open up to. My sister has a deep understanding of humanity and the experience and compassion to go to uncomfortable, dark places in pursuit of truth and knowledge. Her finely tuned writing skills help to outline and color in the picture being painted. For these next two people, you’ll need a bit of backstory on me. I was adopted when I was a baby. As an adult, I met both of my biological parents (at different times and years apart). Now they are both important parts of my life. My biological dad isn’t interested in true crime at all. He’s not a fan of the genre. My biological mom, however, watches and reads anything true crime related. She’s another ID Network addict. My adopted dad passed away eight years ago. He was super supportive of everything I did, but I know he wouldn’t want to talk about this case at all. Sam’s and Julie’s murders, and the loss to their parents, would be incomprehensible for him. I believe he’d have trouble thinking of Daniel as a person. He was open minded, and had a huge heart, but he wouldn’t feel comfortable with me visiting Daniel. He’d likely be (unnecessarily) worried about my safety. My adopted mom is not in my life. Here are the comments from some of my close friends (each has known me for at least fifteen years). I feel like the friendship that you have with Daniel has given you back your “spark.” You are very interested in this subject and writing about him seems to energize you. I’m not concerned about your safety or your sanity. You are a smart, educated women. Of course, you’ve always been slightly off your rocker. I have mixed feelings about this blog. I believe this man is guilty. I am glad this man will remain behind bars for the rest of his life (I am not a supporter of the death penalty). I am frustrated that he is getting attention for his deed. But I am curious. I do not believe the motive for the murder given during the the trial. I would like to know the real story. Maybe my friend can get to the bottom of it. But maybe she is just getting duped. Unfortunately, I think that a lot. I am just glad he was convicted because honestly, I was worried that if by chance he was acquitted and set free my friend would have remained friends with a man who got away with murder. The story is fascinating – especially the theatre connection. I wasn’t surprised at all that my friend would choose a project like this. It’s right up her alley. She has friends from all walks of life. I’m really impressed by my friend’s writing and I’m hoping she’ll eventually turn her blog/book into a solo piece. I think my friend is what’s interesting about this story. She’s more interesting than Daniel. It’s her take on the story that keeps me reading it. Also, I’m a firm believer in supporting one’s friends. True friends look past your mistakes and support you no matter what. That’s what she’s doing for Daniel. Daniel wasn’t a serial killer type. His crimes were situational. But I might have a twinge of worry for my friend if Daniel got out of prison for some reason. While I’m fully supportive of your artistic endeavor and I love hearing all about it — I can’t say that I don’t think it’s weird and scary. I don’t stay up late at night worrying about your safety, but I worry about you getting too emotionally involved or being used or being caught up in some psychological fuckery. I don’t trust people in general, but I really don’t trust people who committed murder and I never for a second thought he was innocent. Like I said, I’m starting from a place of trust issues. But at the heart of all of this, I am a fan of the concept and of your creativity and I think this is a helluva story to be told. As a writer, I’m jealous of the opportunity to unfurl what is potentially a great story to be told. As a reader, I look forward to reading about your experience with this more than Daniel’s motivation or excuses. As a friend, I don’t like him or trust him, sorry. There are so many interesting people to write about who haven’t committed a double murder and aren’t sitting on death row. But since I know you to be such a solidly good person with such a drastically different life, I am primarily riveted by YOUR journey on this. I would never do it. I could never be so open-minded. But I’m never going to understand how you can maintain the relationship. When I think about Julie, I immediately think about my two at OCSA and all those talented wonderful kids there. And then I think about how he killed two people for such little money and it enrages me. There is nothing Daniel can ever say or do to make me feel anything but scorn and hate for him when I think about the victims. And ultimately what I hope for all of this is that this might bring to light some detail for the victims’ loved ones, as well as result in a work of art that sheds light and maybe understanding for those who have a complicated relationship with someone who has caused this much pain & destruction. I think we all sometimes forget that these monsters are actually people on the inside. I want to know what changes them. When Murderer Musings told she was going to start conversing with a suspected murderer, I have to admit I thought it was an intriguing, but an odd idea. I love a good murder mystery as much as anyone. The fact that my friend knew Daniel Wozniak ahead of time was interesting. Then my head went to safety. What if they do become friends and he somehow gets out of jail at some point; will my friend be safe? What about her family being safe? My concerns of safety have become greater since the blog started, and seeing the viciousness of some of the comments. These are the people I now see as the most dangerous to my friend and her family. I don’t want her to tell her identity. I learned a lot from these comments. I hope you guys found them interesting. There aren’t many warm fuzzies toward Daniel, but that’s to be expected. It was nice to know that my peeps have faith in me, and everyone supports me writing the book. Oh, and I promise I didn’t throw away a bunch of comments that I didn’t like! I also made a point to select friends from different circles and walks of life. In the next post, I’ll tell you about Daniel’s recent religious gathering with the Native Americans at San Quentin. 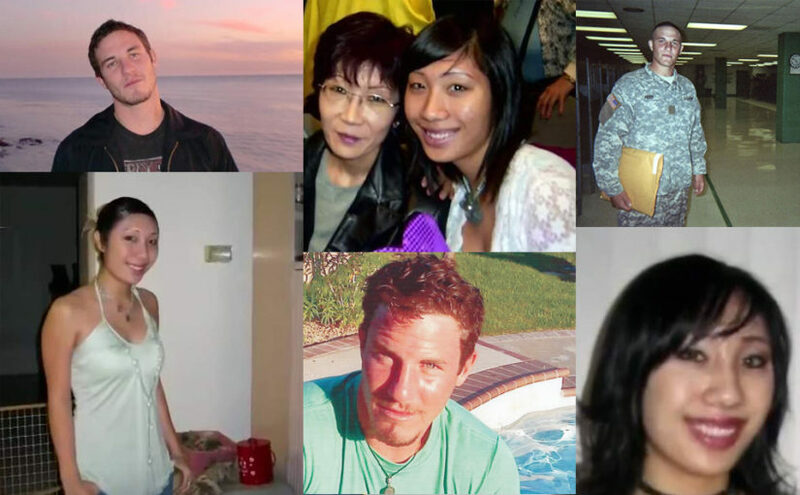 It has been seven years since the brutal murders of Samuel Herr and Julie Kibuishi. Seven years since my friend, Daniel Wozniak, destroyed many lives – including his own. I think about all the things I’ve done in the past seven years, all the life experiences I’ve had, and I can’t help feeling sickened when I contemplate all that was stolen from Sam and Julie, and from the people who loved them. Julie Kibuishi should have celebrated her thirtieth birthday on February fourteenth, and Sam should be blowing out thirty-four candles next week (May twenty-ninth). Neither of them got a chance to graduate from college, get married, have kids… Would Julie be working in the fashion industry? Would Sam have returned to the Army as an officer? These questions haunt me, and I can’t even fathom the pain and anger that their families are forced to revisit every May. Hell, every day. I’ve been writing this blog for two years now, and I can honestly say not a day goes by when I don’t think about Sam and Julie. I didn’t know either of them personally, but my friendship with Daniel is laced with an inherent guilt I feel over him having a life (even a limited one), when his actions stole the lives of two other people; two people who were so young, so loved, and are so missed. Samuel E. Herr was twenty-six when Daniel killed him. Sam was an only child, and he was the center of his parents’ world. He was an Army veteran who had been a combat solider in Afghanistan. He was going to Orange Coast College on the Army GI Bill and had plans to one day become an officer. Juri (Julie) Kibuishi was only twenty-three. She still lived at home with her parents. She was a graduate of the prestigious Orange County School of the Arts (OCSA). She was a student at Orange Coast College studying fashion design. She was also tutoring her friend Sam in anthropology. Julie was one of four children and is always described as the kind of person who would do anything for a friend. My friend caused their deaths. This fact haunts me. I’ll talk about myself more in the next post (and my family members and some close friends have chimed in). But for now, I just want to acknowledge that May twenty first is the depressing anniversary of the murders of Sam and Julie. I send out my sincere condolences to their loved ones.